Atlas V rocket - Solar System Planets And Moons Section. 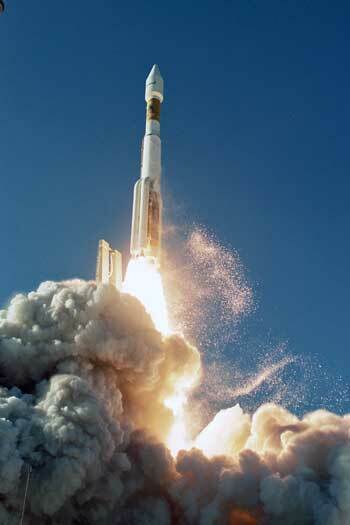 A powerful Atlas V rocket lifted off from Cape Canavaral. Atlas V rocket lifted off from Cape Canavaral. Atlas V rocket lofts satellite for Inmarsat. A powerful Atlas V rocket lifted off from Cape Canavaral on Friday, carrying its heaviest cargo to date: the 5,959 kg (13,138 pound) Inmarsat 4-F1 satellite. The rocket had three additional solid boosters to help it carry this weight into orbit. The launch was delayed one day because of technical problems, but the launch itself went smoothly in good weather. The satellite will be used by Inmarsat to provide voice and data communication services.